Commonly known as a blow up mattress or an air bed, an air mattress is an inflatable mattress whose buoyancy is conferred by the air blown into it. 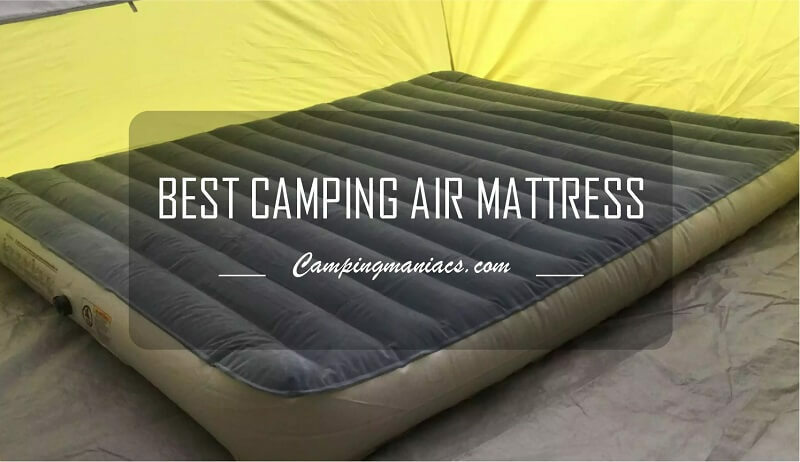 It was originally made of polyvinyl chloride material but thanks to advancing technology, reinforced textile urethane, plastic and rubber have seen the unveiling of the best air mattresses for camping. Air mattresses bring the comfort of one’s bed to the wilderness and thanks to their convenience, they can be deflated, folded, carried and stored with relative ease. If anything, there hasn't been a better sleeping option for campers and hikers than a backpacking air mattress. Even though majorly put into outdoor use such as camping and hiking, nothing really holds you back from using air mattresses at home for sleeping, as extra beds for guests or for recreation. The use of air mattresses has been lauded for a number of health benefits. People who suffer from chronic back problems can use an air mattress to improve the quality of their sleep and in effect the quality of their life. A relatively affordable air bed, the Etekcity is an impressive and one of a kind mattress for outdoor use. What impressed me the most about this air mattress is its 0.35mm thick PVC material which will guard it against all the possibilities of punctures outside there. And, as you’ll realize, that’s not the only impressive feature tucked into this queen size air mattress. The Etekcity is, I dare say, the most comfortable air mattress for camping. Raised 9 inches off the ground when inflated, this air mattress offers unmatched insulation against the most common environmental insults. As you will expect, the bumpy and rugged floors will be effectively insulated against much as cold will. This multi-prong insulation is conferred not only by the suitable height off the ground but also by the unique inner construction that this blow up mattress features. Additionally, the flocking top that the Etekcity air mattress features offers a comfortable surface to lay on. 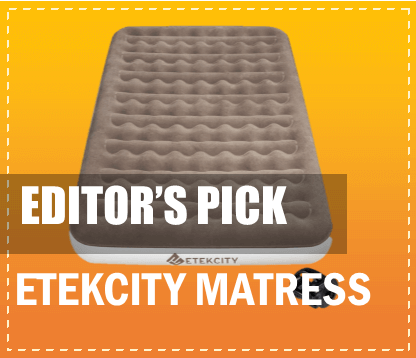 A number of convenience features are subtly crafted into the Etekcity air mattress. First off, this air mattress comes with a rechargeable electric pump which inflates the mattress in just one short minute. The electric pump comes with an AC and a DC adapter and can be recharged at home prior to your trip or in your car. However, caution needs to be taken as a fully charged pump can perform about three inflations only before discharging. Together with the air pump, the Etekcity weighs 10 lbs. The air mattress alone weighs 8.75 lbs. Though not the lightest of the portable air mattresses, Etekcity’s weight is convenient enough for portability. And, as logic would dictate, you wouldn’t expect quality and light in the same statement, would you? The fact that this air mattress folds into a small size when deflated, coupled with the fact that it comes with a carry bag, adds to the convenience of carrying it around. With a 0.35mm thick PVC material, the Etekcity is virtually leak-proof (unless you really want to deliberately make it leak). Even then, the air mattress comes with a miniature patch kit to counter any possibilities of a puncture. Measuring 80 inch length by 60 inch width, this air bed is large enough for two. Its weight capacity rating is 650 lbs and our tests proved that it indeed lives up to the expectations. This is quite something if you asked me. Not the lightest air mattress on the market. Nevertheless, its high quality compensates for this fact. If you are looking for a comfortable, durable and a relatively affordable portable air mattress for camping and other outdoor uses, then the Etekcity will be a great catch. Of course you will have to bear with its 8.75 lbs weight which is awesomely compensated for by the unique quality of this blow up mattress. If it were not for the slightly higher cost, this air mattress would have taken our price for the best camping air mattress. Subtly crafted with the comfort of its user in mind, the Therm-a-Rest MondoKing 3D camping mattress performs spectacularly on all the aspects considered for a perfect air mattress. It is covered by 75D polyester material which provides a comfortable, soft non-sticky surface to lay on. Therm-a-Rest MondoKing 3D self-inflating air mattress comes in two sizes; the large (77 by 25 inches) and the extra-large (80 by 30 inches) variants. The extra-large variant is costlier than its smaller counterpart by about 30 bucks. Other than cost, you will want to make other considerations while deciding which of the two variants to purchase. For example, the average width of a two-person tent is 52.25 inches plus or minus 2.5 inches. This gives you a minimum width of about 50 inches to work with. The implication of this is that using the extra-large variant of the MondoKing 3D, only one air mattress will be accommodated in your tent. On the other hand, two air mattresses of the smaller variant (and subsequently two individuals, perhaps plus one more) will be accommodated side by side in the same tent. Hence, as far as versatility and space is concerned, you may want to put this factor in mind when deciding which size to purchase. Though lighter than the EtekCity reviewed above, both variants of the MondoKing mattresses are heavy. At 5lbs 8 oz for the large variant and 6lb 12 oz for the XXL variant, these aren’t the best air mattresses for backpacking. If anything, you wouldn’t want to carry them too far away from your car or tent. Featuring 4-inch thick vertical sidewalls, the MondoKing 3D offers you a comfortable, full-size surface to lay on. It has been doubtlessly proven that mattresses with sidewalls (3D mattresses) offer about 19% more sleeping surface than those without the sidewalls (2D mattresses). Though a hindrance to compression, the foam core that this air mattress features enhances its comfort and warmth. Together with the air insulation, this foam core confers a whopping 11.4 R-value to the MondoKing 3D, almost the highest that has ever been achieved in a portable air mattress. Therefore, the MondoKing can be comfortably used in all seasons. Unlike the EtekCity and a few other camping air mattresses, the Therm-a-Rest MondoKing 3D does not feature a flocked top. Even then, the foam core that this camping air mattress harbors is a single comfort feature that allows it to be used by side sleepers, back sleepers, stomach sleepers, and those with back pains easily. It contours well with your body edges and pressure points when inflated right. Simply put, this is an air mattress for all kinds of sleepers (except those weighing over 300lbs). Boasting of a self-inflating mechanism, the MondoKing 3D is a breeze to deploy. Its dual valves allow the mattress to inflate and expand quickly when unfolded. Just a few breaths through the well placed two-directional valves and you achieve your preferred firmness. This entire process takes about five short minutes. Nevertheless, the very first time inflation will be a bit of a challenge spanning hours (maybe a full day) before the mattress is fully inflated. What we didn’t like very much about the MondoKing 3D is the fact that the mattress is a bit of a trouble deflating to preferred firmness when you over-inflate it. It can become overly rigid that just laying on it with one of its two air valves open won’t adjust the air level to your preferred comfort level. Getting up and actively squeezing air out of it was inevitable for us. This means that even as you blow air into it to achieve a desired firmness, you need to take caution not to overdo it. Though a great feature for comfort and insulation, the foam core makes the MondoKing 3D a bit bulky. When rolled up for transport, the MondoKing measures about 10 inches in diameter. Removing some more air from it using a vacuum would see this dimension reduce to about 8 inches but it will also take longer to re-inflate for the next use. Returning a deflated mattress to its stuff sack has some madness to it thanks to the stuffy foam. This is not a mattress you would want to carry along in a lone camping trip. We found the deflation manual to be quite handy and you will definitely want to make sure that you have read it before driving yourself crazy trying to deflate the mattress your own way. It scores highly on various comfort scales thanks to its foam core and the 75D polyester. Versatile and practical due to its availability in two different sizes. Has a very high R-value (11.4) which means it is well insulated and can be used in all the seasons. It contours easily with body edges and can be used by all types of sleepers. Has a self-inflating mechanism which is a relatively modern feature of air mattresses. Comes with a comprehensive user manual which aids in both inflation and deflation. Both variations of the air mattress are heavy and not suitable for backpacking. It is slightly costlier than your average air mattress. But this isn’t an ordinary air mattress as you would expect. The foam core, though important for insulation and comfort, adds to the bulkiness of this air mattress. If you are looking for a comfortable, versatile, self-inflating air mattress for only you, the MondoKing 3D is your best bet. Its availability in two different sizes means that you get to be catered for whether you prefer a large or a small sleeping surface. It is a perfect choice for side sleepers, stomach sleepers, heavy individuals, individuals with troubled backs and all other kind of sleepers really. SoundAsleep Camping Series air mattresses are some of the best inflatable mattresses in the business. The air mattresses have some features that will be of great use to a camper. SoundAsleep Air mattresses have a ComfortCoil Technology that boasts of proprietary I-Beam Air Coils specifically designed to increase durability during outdoor use. The air mattress design is inclusive of a pump that assists in inflation and deflation. The pump is rechargeable, and this increases its overall efficiency. The pump can be recharged when needed or at the user's will. This feature comes in handy for those who would like to carry their air bed during their travel expedition. You will be able to charge the pump at the campsite in your car. This feature allows one to use the air mattress not only for camping but also for a host of other outdoor activities. SoundAsleep Camping Air series mattresses are easy to handle and do not require a lot of physical effort. Control of both inflation and deflation is with the touch of a button. One can fully inflate the mattress in less than 3 minutes and this way one does not need to waste their time and energy increasing the firmness and supportiveness of the mattress. SoundAsleep Camping Series offers consumers the option of either a queen sized air mattress or twin sized mattresses and thus suited to fit a maximum of three people. The mattress packaging is inclusive of a carry bag that allows easy transport of the air mattress. The customized design, the improved durability and external rechargeable pump are some of the reasons why campers and backpackers opt for this air mattress. Apart from its flexibility, this air mattress also offers great comfort. The only downside to this pop up mattress is its low height and the fact that it can only support a limited weight. Solitary campers or hikers will find this air mattress comfortable and warm enough for a good night’s rest. The CloudNine Series air bed with Dual Smart Pump Technology is one of the most advanced air mattresses available on the market. The CloudNine Series offers a dual pump system. The system has continuously and silently been part of the mattress’ history and provides a firm mattress. The mattress is perfect for in-home use and thanks to it, overnight guests get to enjoy the convenience of a conventional mattress despite using an air bed. The mattress is queen sized and has three tone settings namely Firm, plush and smooth made for different kinds of sleepers. The mattress has dimensions of 78 inches length, by 58 inches wide, and 19 inches height (Raised “Double-height”) and not forgetting a double chamber construction. Sure-Grip base stops prevent the mattress from undesirable sliding. The mattress has a “set and forget” engine mechanism which inflates the mattress in no time, 4 minutes at most. The built-in main automatic pump effectively inflates the mattress. A patented motor is part of the mattress design, and it is made to be quiet during inflation. The motor design is said to be among the best there is and it boasts of close to 20% noise reduction. The user-friendly pump eliminates sagging and contributes to the loss of atmosphere force that is present in other air beds. This air mattress is incorporated with ComfortCoil Technology I-Beam atmosphere coils. The coil technology supplies a set and smooth sleeping surface for lone sleepers and partners alike. The SoundAsleep mattress is easy to set up and very comfortable. The mattress is engineered to find the optimal comfort degree for its users. The puncture resistant mattress is designed with added durability allowing for normal use in the home and outdoors. The mattress can support a load with weight as high as 500 pounds. An extra thick, waterproof flocked top allows for additional comfort and durability. A carry bag is included for easy portability and transportation. Comfortable and provides adequate warmth. Large and can support weight of up to 500 pounds. Somehow bulky for an outdoor adventure. The only thing that hinders campers from buying this air mattress is its price and slight bulkiness. It is more expensive than other mattresses. Yet, the modern design of the mattress is nearly unmatched. It is yet to disappoint, and it suits the needs of campers very well. With the mattress, one rests assured of top quality sleep where they get to enjoy maximum comfort. Intex's best-selling Classic Downy airbed is a multipurpose air mattress suitable for both indoor use and outdoor camping or hiking. The Intex Classic Downy has a wave beam construction that makes a uniform air mattress surface. The uniform surface allows one to have comfortable, good night's rest regardless of where one is. The plush flocking design of the mattress provides a luxurious sleeping surface and keeps the sheets in place by preventing them from slipping. The air mattress is also easy to clean, and it is waterproofed for camping use. An inflated air mattress has dimensions of 39" x 75" x 8.75" and a 20.8-gauge (0.52 mm) waterproof flocked top with 15-gauge (0.38mm) sides and bottom. The mattress has a thickness of 8.75". It also has a 2-in-1 valve with extra-wide openings that allows for easy inflation of the mattress. The mattress folds compactly allowing for easy transportation. The mattress does not inflate fully. Some may leak and can't hold the inflated status the entire night. The Intex Classic Downy Twin Air Matress is very versatile, comfortable and waterproof, but its air retention capacity is one to ponder. The air mattress has a faulty air retention mechanism. It easily inflates, but cannot stay inflated for the whole night. This compromises its comfort, and for this reason, it does not have the cutting edge other air mattresses on the market boast off. One should think twice before purchasing this mattress. The LaidBack Pad Memory Foam Mattress is a top tier multi-use sleeping pad that is Ideal for tent and car camping, in addition to an outdoor camping experience as a solitary camper or with family. The sleeping pad also comes in handy when one has overnight guests. The non-inflatable sleeping pad does not lose air during the night and can be stored in relatively small spaces such as in closets, car trunks. It can be kept unrolled under one’s bed for easy access in case an extra bed is needed. The LaidBack Sleeping Pad is designed to offer deeper sleeping at night or during naps, more stretching, and more relaxation. The Sleeping Pad is crafted from a Proprietary 3 layer Foam Blend with 4-pound density Memory Foam. The craft design gives one the feeling of a real bed in this 2 3/8” thick sleeping pad. The craft design gives the Camping Bed significant rebound and elasticity, allowing one to sleep on it for years without compromised quality or comfort. The sleeping pad is also puncture resistant. No air is required for the Pad’s functioning, and its durability confers premium portable sleeping pad experience for years to come. The removable, machine washable cover is easy to clean, and the upgraded 1600 Denier Polyester fabric casing makes the mattress durable and long lasting. The pad’s heavy duty design makes it durable. The pad does not use air. The sleeping pad does not fold compactly. The LaidBack sleeping pad does not use air, and this reduces the hassle of inflation and deflation, but this makes the pad relatively heavy. It is therefore not ideal for long distance campers because of the hurdles of portability. Other than that, the sleeping pad is very comfortable and warm, and this qualifies it as a top tier camping pad. The AirBedz Lite Original Truck Bed Air Mattresses come in many sizes. The air mattresses are designed to fit trucks of different makes, be it compact, mid, or full size. The bed layouts may either be long or short. Cutouts on either side allow the mattress to fit around and over the wheel wells in a pickup truck, creating a sleeping space that converts the pickup truck into a bed. The Air Mattress are comfortable, and they offer a solution to truck-bed camping. The mattresses are well suited for outdoor trips and events. They are convenient and offer uncompromised quality good night's sleep. Part of the bed's packaging includes a portable DC inflate pump with 16' power cord for easy inflation. An integrated air coil system is also part of the design, and it functions to distribute weight over a 12" thick mattress evenly. The bed has a flocked top, and this makes it waterproof. The sleeping area covers the entire truck bed and is, therefore, wide enough for two or three people to share. The bed also comes with a convenient carrying or storage bag which has a shoulder strap and thus makes it relatively easy to carry. Wide enough to be shared by two or three people. The bed is great save for its bulky nature and poor air retention capacity. It is wide enough to fit more than one person. It is comfortable, warm and waterproof. The bed offers exceptional service for truck campers. With the Coleman DuraRest, Single High Air Mattress one rests assured of a great night’s sleep with comfort rivaling that which one can get from a bed at home. The high comfort level is in part due to the advanced ComfortStrong coil construction design. The air mattress has a factory-tested AirTight leak-free system, and it has a durable bonded fabric that is strong, light, and comfortable. The fabric is resistant to stretching and can maintain the mattress’ pressure throughout the night. The fabric is also soft to touch. An air pump is not included in the mattress packaging, but the mattress inflates easily to dimensions of 78” length, by 58” wide, and 8” height. The mattress has an inbuilt storage system which makes it easy to pack up and transport the mattress. The mattress can support weight of up to 600 pounds. Weak edges and tuften pops out easily. The air mattress boasts of top notch features that make it comfortable, warm and light, but durability issues deal the air mattress a big blow. Improvements on durability would make the mattress a great camping mattress option, but this is not the case. Coleman has done better, but this is below their standards. One would have to think carefully before purchasing the Durarest Single High Air Mattress. The Lightspeed Outdoors Air Bed has a battery-Operated Pump that has a patented stabilizer system. The mattress uses 192 independent connectors between the top and bottom layers which provide adjustable and even stability throughout the mattress. Mattress firmness can easily be adjusted depending on user preference from soft to firm or vice versa. Adjustments are made using the mattress’ battery-operated pump and the inbuilt Boston valve. The mattress is easy to inflate and deflate. The mattress is crafted from TPU material which unlike PVC does not stretch and thus minimizes movement disturbances in between partners. The bed fits large size sheets and has handles that allow for easy transport. The storage bag that comes with the mattress is large enough to enable one to pack the mattress quickly and easily. The two-person air bed is light, durable and stretch or balloon resistant unlike its PVC designed counterpart air mattresses. TPU (Thermoplastic Polyurethane) material is superior to PVC and is used in the construction of this air bed. The air mattress is light, weighing an average six pounds, and packs considerably smaller compared to other air beds and in effect making it convenient for long distance camping and hiking or storage. TPU, in addition, is very tough and has great shear and tear as well as puncture resistance that helps to ensure the mattress is leak-free. This two-person PVC-free air mattress is more temperature efficient and warm thus ideal for use in places that have low temperatures. The Air mattress dimensions are 79" length, by 55" width, and 6" height with a packed size of 18.4” length, and 9.2” wide. Designed to accommodate two people. The Lightspeed Outdoors Air bed is a top tier bed that provides a high level of comfort and warmth. It is also very light considering that it is designed for two people. The superior TPU material confers durability to the mattress, and this has made it a widely sought option among campers. It is worth the money, but one should watch out because of reported occasional leaks. This model of the KingCamp airbed is made of 100% polyester, 150-D Oxford with a TPU coating. The 2-Person PVC-Free airbed is ultralight, weighing an average of 6 pounds. The airbed has a damp-proof, which is comfortable, durable and long lasting. It can be used for many years. The 2-Person PVC-Free airbed is also very firm, boasting of 192 stabilizers between the top and bottom. The Boston valve air tap and battery operated pump provide easy and rapid inflation and deflation. The comfort level of this airbed can be adjusted to suit one’s personal preference. The airbed’s packaging includes a battery operated pump, compression straps, an oversized oxford carrying bag and repair kit included, all of which aid in the airbed’s functionality and flexibility. The airbed is ideal for both indoor and outdoor use. Guests who have come to stay can use the air bed for sleeping. The air bed is also ideal for outdoor activities such as travel, camping, backpacking, and hiking. The air bed is ultralight. Battery operated pump may fail. The air bed is ultralight considering it is designed for two people. The light nature of the bed does not compromise on comfort and warmth, and this makes the bed campers’ and hikers’ favorite. It should, without a doubt, feature as an option when shopping for an air bed. The KingCamp Light air mattress is one of the lightest and most portable mattresses available in the market, and this makes it ideal for outdoor camping, backpacking, and hiking. The air mattress comes in either single or queen size. The mattress is not self-inflatable and has a full Inflating size of 76” length, by 27.56” wide, and 3.93” height for single size whereas the queen size has full inflatable dimensions of 76” length, by 54.33” wide, and 3.93”height. The average weights being Single: 3.74 pounds and the Queen: 7.71 pounds. The air mattress is crafted from 100%polyester and a 150-D Oxford with PVC coating. This camping mattress is waterproof, puncture and stretch resistant. It is also environmentally friendly, and the design material makes the mattress durable and thus ca be used for many years without shear or tear. Despite the lack of a self-inflate function, the air mattress is remarkably easy to inflate thanks to the built-in foot pump design. The mattress has a wave system that increases solidity and comfort of the air mattress. The KingCamp Light Air mattress boasts of 192 stabilizers between the top and bottom which help in the mattress’ firmness and stability. Compression straps and an oversized Oxford carrying bag, and repair kit are included in the mattress package. The mattress folds compactly, and this is in part because of the compression straps. The oversized carrying bag helps a great deal in the transportation of the mattress from place to place. The inbuilt foot pump takes long to inflate. The KingCamp Light Air mattress is not on the same level with its counterparts in the market. It is far from a top tier air mattress. The mattress is not as comfortable and as warm as other air mattresses and therefore is not suited for use in places that experience extremes of cold. The inbuilt foot pump is easy to use but it takes a while to inflate, and the mattress foam is thin. Modern air mattresses on the market are better than the KingCamp Light mattresses but for its price it is just right. On a brighter note, the mattress is durable, waterproof and light. For these reasons, one should probably have a second thought before settling for the KingCamp Light. With handpicked best airbeds, choosing the right fit for camping, backpacking, hiking or recreational use indoors should no longer be a nightmare. People choose air beds based on what the intended use is. Apart from the intended use, there are several other considerations that one ought to have in mind when shopping for an air bed. Modern air beds are designed to be versatile and thus can be used in any situation; be it indoors or outdoors. One also buys an air bed based on climate. Summer will prompt one to opt for an air bed that is neither too warm or too cold, an air bed that is thermally stable. Cold weather, on the other hand, will prompt one to shop for an air bed that can preserve warmth. Comfort is another general consideration when shopping for an air bed. Comfortable air beds bring the bed experience to the wilderness and offer a good night’s rest giving their user quality sleep. Most airbeds are inflatable. Easily inflatable air beds save on time and energy and are therefore preferred to those with cumbersome inflation and deflation mechanisms. In handpicking the best air mattresses to review, we put all these factors into considerations to make your shopping experience seamless. The Best Sleeping Bags for Camping Handpicked Specifically for You!